I've seen a few reconstructions of this class (yes it's the one you're thinking of most probably) and I was wondering... where they actually got that idea from. So I thought to ask you people who know - is there basis for the class actually looking like the reconstruction, or is it a re-enactorism? 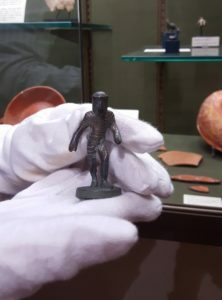 The reconstruction is based on a little bronze statuette found at Versigny in France and now kept at the Musee Jeanne D'Aboville. The theory is that this is a depiction of a type of Gallic gladiator described by Tacitus, "clad after the national fashion in a complete covering of steel. They were called crupellarii..." (Annals, 3.43) The accuracy of the reconstruction is anybody's guess though! You can find more information and quotes in this thread here.